The latest creative campaign from the Purplefish team is being let loose on the people of Bristol and Bath this week. A new app concept, Huggg, enables people to text friends a comforting coffee or celebratory drink with a personal message via their phones. Bristol and Bath has been picked as the UK launchpad for the app based business by founders Paul Wickers and Alice Cox, both based in Bristol. 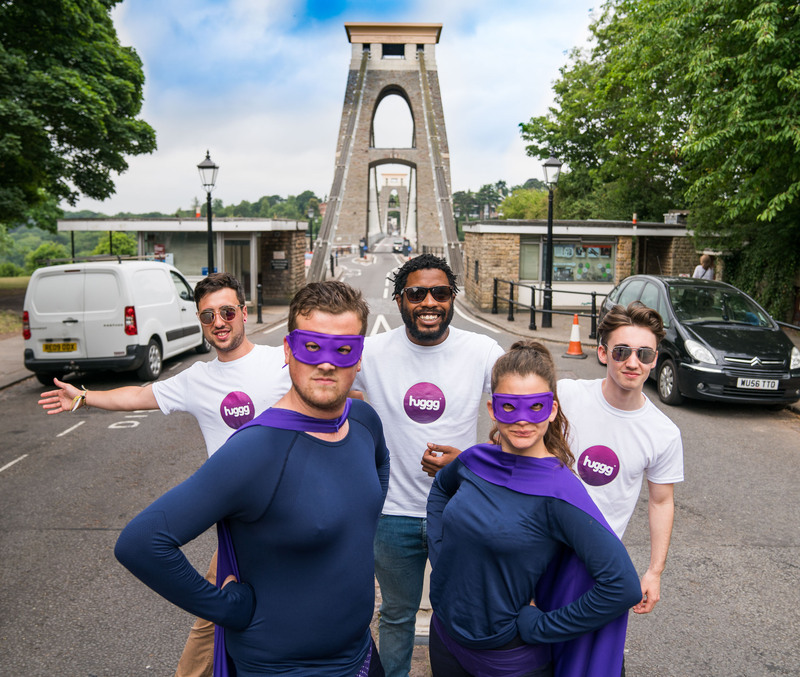 The launch campaign involves a team of ‘Huggg heroes’ who are roaming the two cities’ streets this week (from 17 July) spreading the Huggg message adding a touch of superhero style to the brand’s introduction. Available for free in the app store, Huggg has partnered with several much-loved brands including Friska, Turtle Bay, Be At One, Byron and Society Café to offer carefully selected items from their menus as ‘hugggs’. Users download the app and can use it to send ‘hugggs’ to friends, family, colleagues or anyone else they feel deserves a treat, selecting which food or drink item is best suited each time, whether it is a thankyou dinner, a birthday cocktail or a cheering cappuccino. “There are points in life where a message alone doesn’t say enough, and a little extra thoughtfulness would go a long way,” said Paul Wickers, Huggg co-founder and CEO.